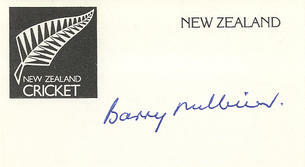 This is a Hand Signed white card 3.5" x 2" by the former New Zealand Test Cricketer. Barry Douglas Milburn (born in Dunedin on 24 November 1943) was a cricketer who played three Tests for New Zealand in 1969. Milburn was a lower-order right-handed batsman and a competent wicketkeeper who played for Otago from 1963 to 1983. He was one of a succession of New Zealand Test wicketkeepers of modest batting ability in the mid to late 1960s, and was first choice for only one Test series, the three matches in New Zealand against the West Indies in 1968-69 when, like his predecessor Ray Harford he batted at number 11. Milburn also toured England in 1969 and India in 1969-70, but Ken Wadsworth, a much better bat, was seen as the principal keeper on both tours, though an injury in the later stages of the England tour did not help Milburn's cause at a time when Wadsworth was also struggling for runs.